Tonight’s Thursday night “showdown” is between two AFC South foes as the Jaguars hit the road to face the Titans. This game in the league office is probably known for it’s ability to kill two birds with one stone, as if you’re going to put either of these teams on in prime time, why not get both of them out of the way on the same night. Despite that because this the AFC South, this game could actually have big implications in playoff races later in the year. After an offseason filled with hype after their offense made big strides in 2015, the Jaguars have regressed thus far in 2016. In a quarterback driven league, most of the blame in this regard is going to fall on Blake Bortles. With inconsistent mechanics and failing to show the ability to win within the pocket as teams would like to see, some are already chalking up last season as the outlier in Bortles’ career. However, this is still just his third year and there are things he does well. In situations that are uptempo and when he’s able to roll out of the pocket, Bortles seems far more comfortable. The team also has seemed to take less shots down the field than they did last year, which also goes go against Bortles’ skill set as he is more of a gunslinger than a guy who will beat you with surgeon like precision. Even in a decent matchup, it’s tough to trust Bortles for fantasy purposes tonight. The Jaguars still have very talented young receivers, but whether it’s Bortles’ struggles, the league adjusting to them, or a mix of both, they haven’t met expectations to this point. There is no denying Allen Robinson’s talent, but him failing to notch more than 75 yards in his first six games is troubling. Drops have also been an issue as he has seven alone in his last five games. He’s going to turn it around eventually, so even with these struggles you probably have to start him in all fantasy formats. Allen Hurns has been a little more consistent than Robinson, but not surprisingly his touchdown rate has dropped off from a great 2015. He’s worth looking at as a third receiver in a week with six teams on bye. A sleeper to look at this week is Marquise Lee. Dubbed by his offensive coordinator as the “Albino Tiger”, Lee has led the team in receptions in each of the last two games coming off the bye week. Bortles seems to be looking his way often, so don’t be surprised if he has another productive night. At the time of this writing, Julius Thomas’ status for the game is up in the air. So if other options are there, I’d suggest looking towards them in fantasy formats. Against an above average run defense in an unpredictable timeshare, the Jaguars running back situation is one to avoid if you can. T.J. Yeldon is the current starter, but both he and Chris Ivory have been ineffective to this point. Both backs figure to see a max of 10 to 15 touches. For the Titans on offense, this game figures to play right into what they do best which is running the football. 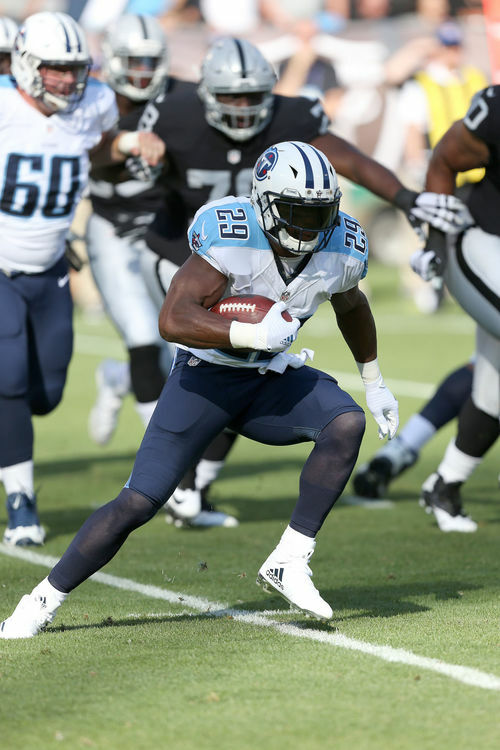 In an offense that’s a better fit for his running style, it’s not surprising that DeMarco Murray is having a bounce back year. The Jaguars have had their struggles against the run, and haven’t faced a back of Murray’s caliber to this point. Murray should see at least 20 to 25 total touches and could be one of the top scoring backs for fantasy purposes this week. Despite the talk in the preseason, Derrick Henry hasn’t had the role many expected. While he may get a handful of touches, for the time being his fantasy value is as a stash in the event Murray misses time. While it may seem appealing at first glance, this could be a difficult matchup for Marcus Mariota. The Jaguars pass defense is much improved from years past, and the Titans just don’t have a ton of options that can separate. Even Mariota’s top target Delanie Walker has a difficult matchup as the Jaguars have fared very well against opposing tight ends, and Telvin Smith is one of the few linebackers who can stay with him stride for stride in coverage. Walker should still around six to eight targets thrown his way, so he’s worth a start in most fantasy formats. The recipients of Mariota’s other targets are really anyone’s guess. Tajae Sharpe leads the team in targets, but hasn’t had a game with more than 60 receiving yards since week one. Other than that, they’re likely to be split among Rishard Matthews, Andre Johnson and Kendall Wright. Who is the beneficiary of that is anyone’s guess, so it’s certainly worth avoiding if possible. In recent years, these games have been competitive so this could actually be a nice way for fans to see players and franchises they’re not usually getting exposure to. Time is also ticking in Jacksonville, as there was reportedly an owner held meeting in recent days which is a sign that if they don’t start winning, something is sure to change. In the end, I have a tough time going against the Titans in this one knowing they should be able to establish the run on offense, while the defense continues to flash their ability to rush the quarterback. My prediction is Jaguars 20 Titans (-3.5) 24. This entry was posted in NFL, Picks against the spread, week 8 predictions and tagged 2016 NFL Predictions, 2016 week eight fantasy football predictions, 2016 week eight predictions, Allen Hurns, Allen Robinson, Andre Johnson, Blake Bortles, Chris Ivory, Delanie Walker, DeMarco Murray, Derrick Henry, Jacksonville Jaguars, Julius Thomas, Kendall Wright, Marcus Mariota, Marqise Lee, NFL, Picks against the spread, Rishard Matthews, T.J. Yeldon, Tajae Sharpe, Telvin Smith, Tennessee Titans. Bookmark the permalink.